Eurocell – operator of the fastest growing network of building product outlets in the UK - is opening its latest branch at Bridlington in East Yorkshire, bringing the total in the UK to nearly 200. The move creates two new jobs and makes more than 4,000 building products immediately available to installers and DIY decorators working in the area, who will no longer have to travel so far to get their materials and tools. “The Eurocell approach is to make things as easy for our customers as we can,” says Regional Manager Michael Dyer. “So, we have a big branch network so they’re never far away from one of our outlets. It also means that we’re on the doorstep in Bridlington. The Bridlington branch is on the Bessingby Industrial Estate, on Bessingby Way, and just off the A165 into Bridlington town centre. Trips to major towns in the area take 30 minutes or less, so Eurocell branch staff can easily and swiftly deliver fascias, soffits, guttering and many more PVC-U products throughout the region. Bridlington branch complements other branches at Hull, Selby, and Scarborough. Eurocell has recruited two high calibre staff with 40 years’ experience in building plastics between them for the Bridlington branch, Branch Manager Mike Rushworth and Branch Sales Manager Mike Hewison, who will also run the Scarborough operation. Together they can offer expert advice to the trade and to DIYers alike. As with all Eurocell branches, there is plenty of space to park and load, and associated suppliers such as Graham Heating and Plumbing, Howdens and BSS are also on the estate so there is no need to make a special trip to pick up the necessary kit. Eurocell branches are identical so customers can find what they need easily so the Bridlington branch has a showroom with a large trade counter area that showcases products such as Skypod skylights and Equinox tiled conservatory roofs. It also supplies roofline and rainwater systems, window finishing trims, doors and conservatories as well as lines such as underground drainage, hand tools, power tools and protective clothing. Many of these are designed and manufactured by Eurocell, so customers gain all the benefits of buying direct. 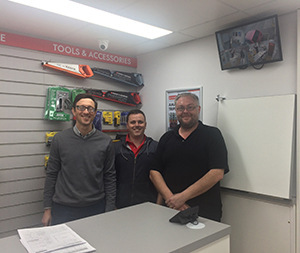 Pictured from left to right: Mike Hewison (Branch Sales Manager), James Teahan (Trade CounterWarehouse Assistant), Mark Rushworth (Branch Manager).